Earn $16.70 in VIP credit (1670 points)What's This? 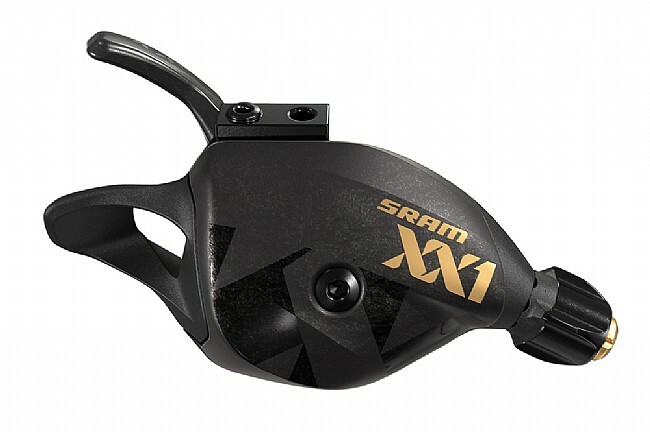 The SRAM Eagle XX1 Trigger Shifter has a redesigned mechanism, featuring the same confident Zero Loss™ engagement found on previous XX1 shifters but with more precision and smoothness than before. Ergonomics are improved with an adjustable thumb lever, and there is weight savings aplenty with said lever being crafted from carbon fiber, along with a carbon fiber bottom cover and titanium hardware. Integrated MatchMaker™ X compatibility makes for a clean setup on the handlebar. Slick Shifter that is nice and smooth for the Eagle system. This shifter is expensive but you get what you pay for. Nice and smooth, well built piece that integrates well with the other Eagle products. Great adjustability and function. I am glad I sprung for the XXl shifter.